10 In. x 14.5 In. Silver Foil Doilies - 4 Ct.
16 In. Round Gold Foil Doilies - 4 Ct.
10 In. x 14.5 In. Gold Foil Doilies - 4 Ct.
10 In. Round Silver Foil Doilies - 6 Ct.
10 In. x 14.5 In. Catering Doilies - 100 Ct.
12 In. Round Gold Foil Doilies - 6 Ct.
10 In. Round Gold Foil Doilies - 6 Ct.
16 In. Round Silver Foil Doilies - 4 Ct.
4.5 In. 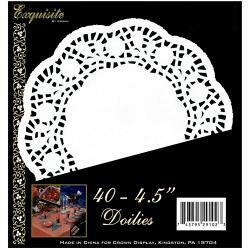 Round White Paper Doilies - 40 Ct.
8 In. Round Gold Foil Doilies - 10 Ct.
12 In. Round White Paper Doilies - 8 Ct.
10 In. 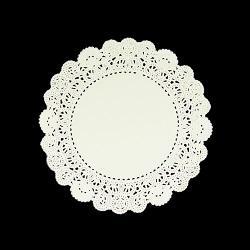 Round Catering Doilies - 100 Ct.
6.5 In. Round Silver Foil Doilies - 15 Ct.
6.5 In. Round Gold Foil Doilies - 15 Ct.
4.5 In. Round Silver Foil Doilies - 20 Ct.
4.5 In. Round Gold Foil Doilies - 20 Ct.
8.5 In. 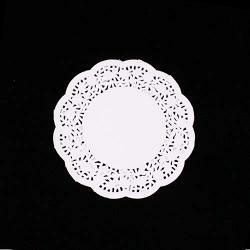 Round White Paper Doilies - 20 Ct.
6.5 In. Round White Paper Doilies - 30 Ct.
5.5 In. Round White Paper Doilies - 40 Ct.
You can find paper doilies in different colors such as gold silver and white. They are available in many different sizes as well. The prices are perfect for buying these wholesale paper doilies in large numbers. 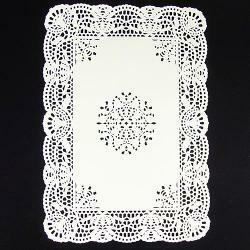 The prices of these paper doilies wholesale start from just $3.99 per pack of 100 doilies.